Shirdi Sai Baba Stories,Leelas and Teachings. : My Experiences With Sai Baba -Sai Devotee Selvaraj. Sai Devotee from Coimbatore has shared beautiful series of experiences. All the experiences represent different aspects of life. 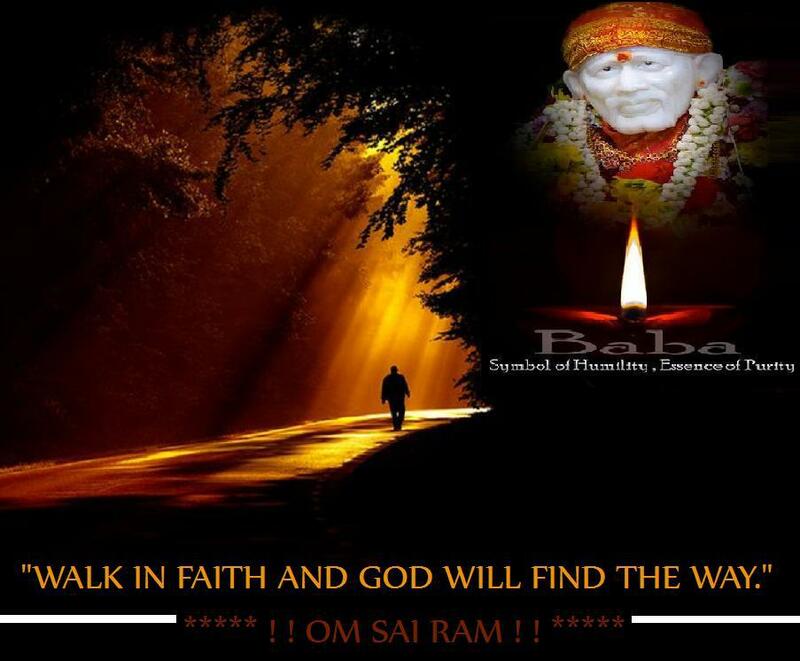 Devotee’s faith on Saibaba is very intact which gives him courage to face every scenario of life. Saibaba always provides us what is best for us.Jai Sai Ram . In 2006, I was transferred to Shamshabad and after few months, we shifted our family from native place to Shamshabad. My wife’s aunty gave a book about “Sri Shirdi Sai Baba vrat mahima”. We took the book along with other devotional books .Then we got transferred to Warangal, after which we shifted to native place Coimbatore in 2007 for a new job. We had to shift to Sivaram nagar for my daughter’s higher education in 2010, that book came with us (even without our knowledge). In March, 2012, my daughter was preparing for her plus two exams. One day while sorting out old newspapers and books, my wife saw same book. With some temptation, she read the book, and the experiences of Baby Kethal’s parents, which attracted her because my daughter was also in a state like Baby Kethal. Evening she asked me that shall we start 9 week Guruwar vrat. Then we started the vrat with best of our knowledge. My daughter was not interested in studies. Suddenly we felt some changes in my daughter. She started studying well. In parent –teacher’s meeting at school, my daughter’s class teacher (Who gave admission to her), told to my wife that she felt very much sad for giving admission. After my wife started vrat, exams happened, post which results were declared. With Baba’s grace, my daughter got 1045 marks. Main highlight is her teacher proudly spoke about my daughter with my wife.Jai Sai Ram . Saibaba provided admission to my daughter. We started another cycle of 9 week vrat for seeking easy admission without too much donation. Then I shaved my head for a special reason to famous Othimalai Muruga’s temple. I prayed Baba, if my daughter got admission as she likes, after completing 9 week vrat, I again will shave my head for Shirungar Nagar Baba temple. With Baba’s grace my daughter got admission in Coimbatore PSGR Krishnammal College in B.Com CA in merit, easily. As I prayed, I shaved my head and went to Shirungar Nagar Baba temple, how can I thank Him? Saibaba helped my sister to join as teacher. After a very long period of waiting, my second sister got post for teacher in Gudalore Taluka, Kolappalli Govt School. My brother in law’s family refused to go and join same because of staying alone there. We prayed to Sai for his help with tears. My sister was very much depressed. Hearing about same we also felt sad. We were not going to meet her for few days. Next Sunday, I and my wife went to my sister’s house. Sister has gone to temple. Her daughter told that mother is joining duty from tomorrow (After receiving order from C.E.O, Ooty). Miracle is another teacher from Kumutham Nagar, Coimbatore also got posting in same school. They went to Kolappalli, made all arrangements. In the school they got information about one more teacher from Coimbatore who will be joining soon. Her husband went to CEO office, Ooty and collected address of my sister. He came to my sister’s house and convinced my brother in law and his family. Our joy has no bounds. We went directly to Shirungar Nagar Baba temple and thanked Him.His blessings are countless. Purchasing or constructing a house was a long time ambition of my wife. We have searched within our budget but to no results. Every day we prayed Baba that if we can buy a house we will come to Shirungar Nagar Baba temple by walk and named the house as “Sri Sai Nivas”. Some days later, we saw a new built house. We all were satisfied, but cost was too high more than our expectation. We thought to sell our site of 11.49 cents in Udumalpet and balance will be arranged through bank loan. We finalized that house. For fast process, we asked our father in law, who sold his site recently, to buy our site. He told that he will think of it and inform in one week. After a weeks time, he came to my house, we asked about our request. Unexpectedly he told he will give share of 18 lakhs each to my wife and her sister. Then we asked my brother in law to buy our site. They had some other ideas first. As we continuously prayed with our Baba, finally they came forward to buy our site from their share. With these amounts and bank balance, I borrowed only 3 lakhs loan from my father in law and registered the house in just 20 days. With Baba’s grace, we planned and held graha pravesam in 2 days and the same day we shifted all the belongings. We discussed and told Iyer (Pandit) to name the house in Tamil as ‘Sri Sai Illam’. But at the time of pooja, Iyer told as “Sri Sai Nivas” (he didn’t know what we planned earlier). Then we named our house as we prayed with Baba. After some days, I and my wife started pada yatra (going temple by walk) to Shirungar Nagar Baba temple. It was 10 KM away for our house. It is not easy for my wife to walk continuously 2-3 KM at a stretch. We decided to walk after taking some rests. But to our surprise, we reached Baba temple nonstop. Even now I admired how we reached without taking intervals. In one my favorite Tamil song of Baba, one who does patha yatra to baba temple, Baba will bring him to temple by making him walk on silk carpet. When I came across these lines, I felt it was narrated for the sake of beauty of lines. But we felt the kindness of Baba. Above all, my wife asked can we return home by walk. We didn’t feel any pain even after returning to home. On 19th December, 2012, my elder sister’s daughter asked me to accompany her for an interview in NCL, Pune for Phd research scholarship. She asked me to come with her and planned to go to Shirdi. I told it’s not possible to get five days of leave. Then she asked me and my wife to come with her on 15th December from Coimbatore. For return she said she will arrange on 17th night from Pune (For me and my wife) .She also asked to keep return arrangements for 19th for her and my wife. This was as a backup plan, if her friend is not coming with her during return. We accepted same. She had booked tickets for onward and return journey. We have to leave for Shirdi on 15th December. On 13th night my daughter told us that she also wants to come with us. We tried to convince her, but she was not agreeing. I tried to book ticket for her through tatkal booking on 14th morning 10 A.M. As net connection was too slow, we had trouble to book the ticket within time. I prayed Baba if I got the ticket, I will collect money from friends and bring the same amount to Him. Within minutes, ticket was booked. I asked my friends and relatives for donation to Shirdi. Rs.1110/- was collected. We four had to catch train on 15th December at 8.30 A.M. But train started 3.5 hour late by 12 Noon. We booked connection train to Shirdi from Kurudvadi Station. From there one friend of my sister’s daughter will receive us and come with us to Shirdi for helping us. It is her native place. She is a Doctor and story writer in Marathi and English. She has the talent in writing both hands. We thought train will compensate for delay. But it went so late by giving way to other trains. We became tensed. We were going to miss the connection train. We reached Sholapur, 6 hours late, by 12.15 P.M next day. From there to Kurudvadi running time is around one hour. If the train will go without stopping, we may catch the connection train or else we will have to miss it. We prayed Baba to help us. Fortunately the train went in good speed and reached Krudvadi Staion by 1.15 P.M. Friend and her mother was waiting for us with food and water. We came to know the Sainagar Express train will come 2 hours late. We got the train and journey was so comfortable. We took a lodge and took very good darshan of Baba on 17th morning. When we stood in the queue my mind was restless. I cried and asked Baba for a happy mood before leaving his temple. It is true, when I saw and stood in front of him, I felt very much happy. My wife luckily got one leaf from the divine Neem tree. We put the collected amounts to Undial (Dakshina box). We had purchased Baba statue and photos for relatives and those who donate the amount. Then we reached railway station and no train was available at that time to Pune. We returned to bus Stand to catch bus for Pune. When we reached bus stand one bus was ready to leave for Pune, but no seats were available. I decided to go standing in bus. My daughter and sister’s daughter were very angry. How can we wait there for hours with language and other problems? With grace of Baba, two persons got down the bus and we two got seats. After some time, before crossing the borders of Shirdi another two persons got down from the bus and we all got the seats. I and my daughter left on 17th midnight and my wife and sister’s daughter left on 19th midnight, after the interview. It was a pleasure trip to all of us. I kept Saibaba’s Udi which I got from Shirdi in our pooja room in front of Baba’s statue. One day it was missing from that place. I was very much depressed and felt like everything has gone from us. We thought it was thrown away and searched for three days everywhere but it was not seen. My wife and grandmother became very sad. We prayed to Shri Saibaba. I went to Naga Sai temple and collected UDI from there. Up to some extent it helped us to bring down our sadness. After one week or 10 days,when I was in Office, my wife called me and happily said that the UDI pocket was found outside the house where we searched for three days, without any damage. Our happiness had no bounds. On the way to my office, in a temple near fence, I saw back side of a Saibaba statue. I felt very sad that it was not under roof and got affected by rain and sun light. I thought to take that statue to my home. Two three days went in thinking about same. Finally I and my daughter went to that temple to ask the priest for taking the statue. Nobody was there. We went inside and saw the statue which was badly affected having a big hole in chest and one hand was not there. I felt depressed and sad. We discussed with my wife who was interested in hand works. She told me to bring the stature she will do the best to repair same. Next day morning I went to the temple and asked the priest permission to take the statue. He told it was damaged. I convinced him and got the statue to home. On the same day when I reached my office, I saw plaster of Paris was available there; I got permission to take some quantity of it. In two days my wife managed to make the damages and put a new hand showing ‘abayahastham” and repainted statute with poster colors. We all felt happy. Now Baba is in our Puja room. In so many small incidents and experiences, I felt the presence of Sai Baba. Whenever we saw Baba’s picture or statue unexpectedly, we felt a great pleasure. I love you so much Baba. What a beautiful experience. Thank you for sharing with us. Just loved it each and every moment. Thank you Sai baba giving your devotees such a blessings. My head always bow at your lotus feet. Thank you for relating your experience...in fact I could very well connect myself with your experience due to the mention of Sai Baba statue at Birla Temple of Hyderabad which reminded me of my experience with Baba there...my prayers were heard there many years back when I had just started following teachings of Baba. Also, walking to Sai Baba temple is something I used to do on and off but had stopped in recent time. Thank you for reminding me to get going with it again. Om Sai Ram. !